Kohn, E. (2013). 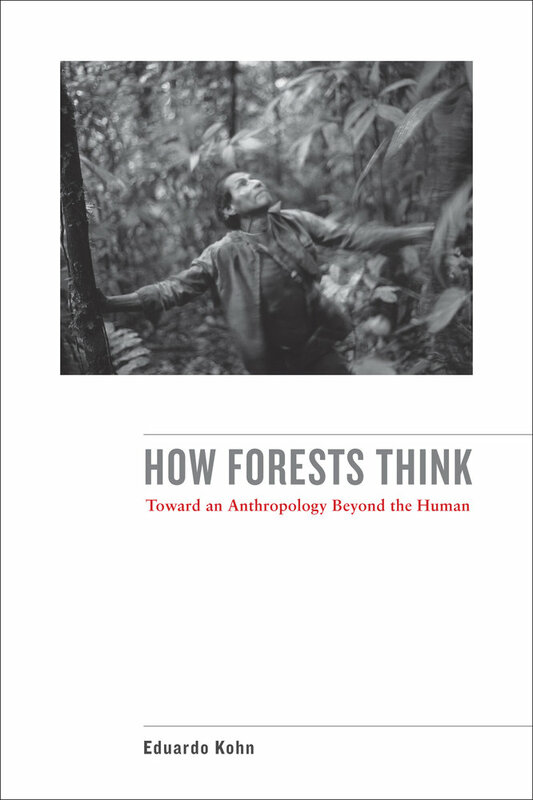 How Forests Think: Toward an Anthropology Beyond the Human. Berkeley: University of California Press. When people think of trees they most certainly would not associate them with having the ability to create thought processes. This is, of course, because trees have no brains. However, in his book How Forests Think: Toward an Anthropology Beyond the Human (2013) Kohn indicates that trees (and other beings) have the ability to think and discusses how they accomplish this. He pushes the reader to step out of an anthropocentric view and re-evaluate how humans can interpret the world. Indeed, the author stresses that the field of anthropology has been too short sighted and has not yet fully explored how other beings constitute what it is to be human. Therefore, by studying the world outside of the human this gives insight towards what it truly means to be human. Kohn explores this idea by conducting an ethnographic study of the Runa people in Avila, Ecuador. Kohn builds his case that trees and other nonhuman entities think by delving deep into semiotics. He explains that all beings can represent, produce, and interpret signs. Thus, the entire world is made up of semiotics. All beings, in their own way, respond to these signs and subsequently grow and adapt to these sensory inputs. Kohn repeatedly emphasizes that signs go further than just simply the realms of human symbolic interpretation. The author recognizes that even evolutionary success is dependent on responding or not responding to particular environmental signs. An “ecology of selves” is then used to explain how relationships between individuals, through the process of sign interpretation, is how individuals are defined. Individuals then can be said to “represent and are represented by other beings” (p.78). Therefore, “if selves are thoughts and the logic through which they interact is semiotic, then relation is representation” (p. 83). This is made clear by examining tree characteristics and spatial orientation. Trees that have specialized characteristics “form relatively more nuanced and exhaustive overall representation[s] of the surrounding environment” (p.81). Pest resistance is an example of these specialized characteristics and this shapes where a tree species can be naturally found. This is how trees think. Relationships amongst trees (and other beings) form repeated arrangements that can be predictably exploited. Modern and historical forestry markets are one example of humans’ understanding environmental relationships or misunderstanding in the case of over-logging. These misinterpretations or simply ignoring environmental associations is called soul blindness where “treat[ing] other selves as objects” (p. 119) and being “[unable] to see beyond oneself or one’s kind” (p.117) is the cause of not understanding the interconnectedness of nature. The author explores complicated topics, such as the ecology of selves, by using examples in everyday Runa life. Metaphors as well as pictures are used to emphasize key points. Consistently referencing and referring back to environmental examples firmly grounds this theoretical work. Kohn does a fantastic job in explaining how understanding relationships amongst various beings can sometimes be quite complex and that the virtual can be sometimes used to understand the perspective of other beings. The Runa often use dreams or the hallucinogenic properties of substances to make sense of the living, material world. As this book substantially delves into semiotics it is no surprise that Peirce’s many works are referenced extensively. Therefore, how symbols, indexes, and icons are seen and interpreted by various living things is a main area of focus. However, unlike other authors who build on Peirce (see Cambre, 2012), Kohn fails to explain how or if artifices fall into this ecology of selves. Another concern is that the concepts presented are quite complex and challenges traditional scientific thought about biological processes, life, and even the afterlife. Kohn even goes so far to say “a modicum of goodwill, patience, and the willingness to struggle” (p.14) is necessary for reading this book. Despite giving great support that his conceptual framework can be supported by the Runa way of life the question of how this can be applied to a more urban setting is not discussed. While the reader themselves can apply Kohn’s ideas to an urban environment since nonliving physical material is underestimated in this work this application is limited. Kohn states that “all sorts of entities, such as stones, that I would not… consider living selves” (p.94). However, in an urban environment, nonliving physical material, such as steel, is a dominant part of everyday life and play a significant role in power relations (see Latour, 1984). This is exemplified by the fact that the accumulation of physical nonliving material is highly valued in western, developed societies. Moreover, in Hawai’i stones hold special significance as they are treated as ancestors (see Becket & Singer, 1999). Thus, applying the ecology of selves to communities, other than Avila, does not accurately describe human nature relationships if nonliving material is excluded. Kohn demonstrates that living actors, not just humans, influence and are influenced by the living things around them. He indirectly offers a critique to developed nations by indicating that they may have become soul blind to the world around them. The ecology of selves proves to be a formidable concept when applied to forest ecosystems and capable of answering an old philosophical question: “A palm tree crashing down in the forest would still make a sound even when no one… is around” (p.207) as the trees themselves are more than capable of producing a response. Anthony Fisher, University of Alberta, Canada. Becket, J., & Singer, J. (Eds.). (1999). Sacred Stones, Sacred Land. University of Hawaii Press. Cambre, C. (2012). The Efficacy Of The Virtual: From Che As Sign To Che As Agent. Public Journal of Semiotics, 4(1), 83-107. Latour, B. (1984). The powers of association. The Sociological Review, 32(S1), 264-280.